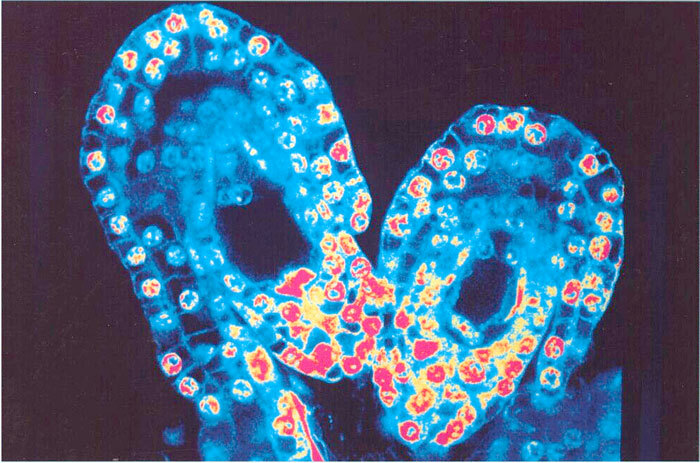 Longitudinal sections of two ovules of the orchid, Epipactis helleborina, photograhped from an image on the confocal laser scanning microscope and artificially colorized. Abstract: The development of the female gametophytes of Epipactis atrorubens, E. helleborine, and E. palustris have been investigated using confocal scanning laser microscopy. 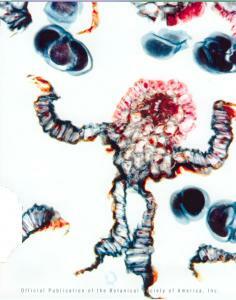 These species have T-tetrads and eight-nucleate female gametophytes in common. 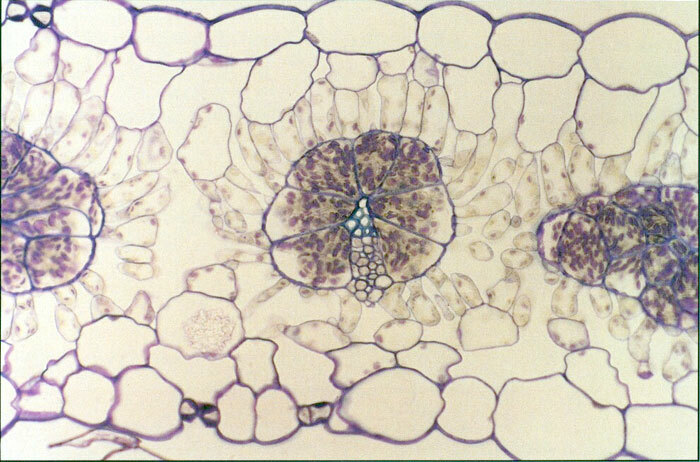 The development of the female gametophyte is monosporic in accordance with the Polygonum type. 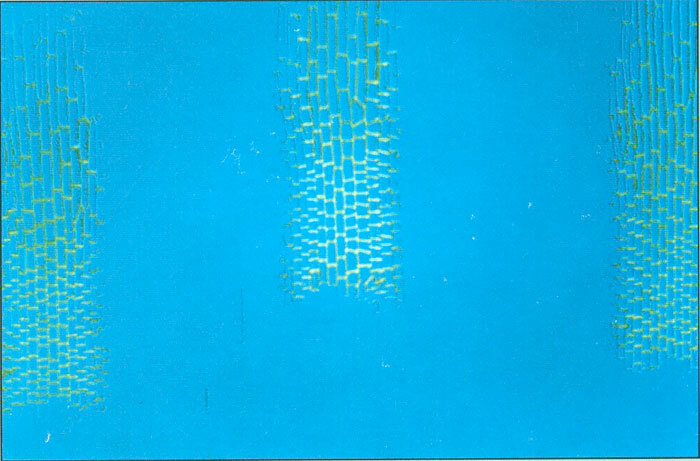 Furthermore, the outer integument grows slowly and reaches to the middle of the inner integument, when the female gametophyte is mature. 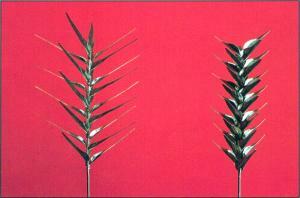 In the first two species, T-tetrads develop prior to anthesis, which may be correlated with autogamy. 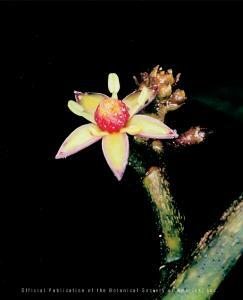 The development of the female gametophyte of E. palustris appears to be similar in plants from different localities. Two plants of Ombrophytum subterraneum (Balanophoraceae), parasitizing Tessaria roots. The plants are reportedly entirely subterranean, even during flowering and seed dispersal; excavation is necessary to locate and study them. 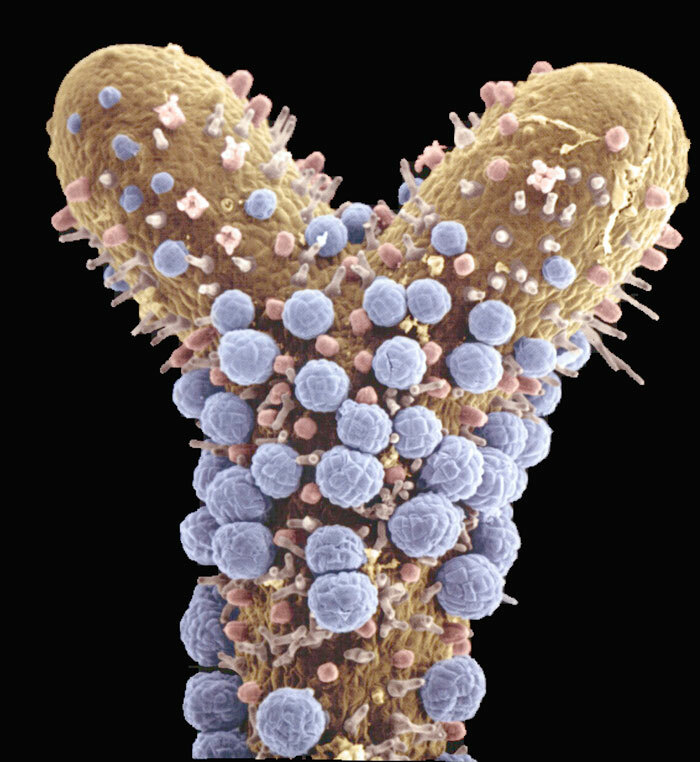 Joined calcium crystals (color transform of scanning electron micrograph) isolated from Capsicum annuum anther connective tissue. These crystals (large one a prism, small one a spherulite), form either together or separately in connective cells during microsporogenesis. 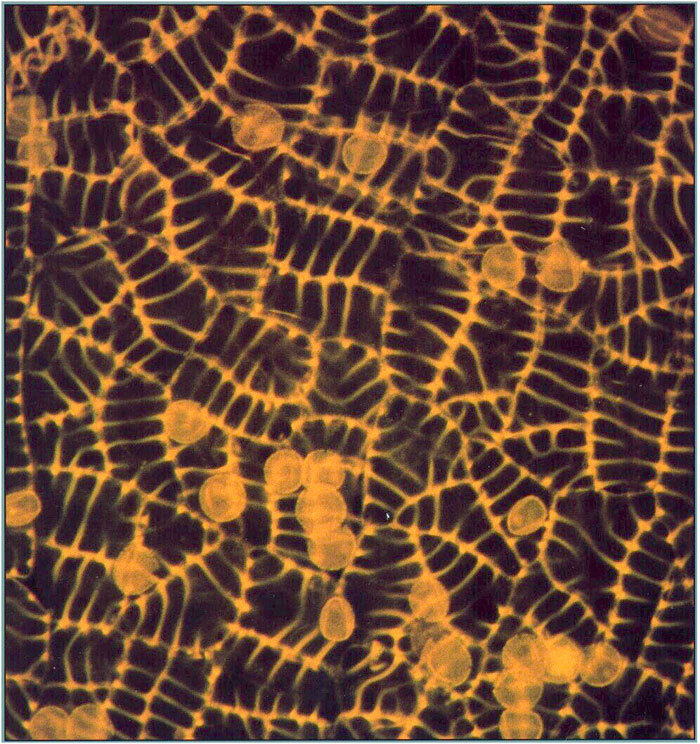 Young peridiate spore of the zygomycotinous fungus, Glomus mosseae, showing branching hyphae that will eventually form a weft. 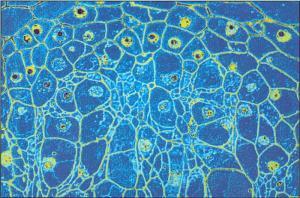 Homogeneous (all blue) and heterogeneous (with white globoids) protein bodies occur in different cells in the cotyledon of Lupinus luteus. 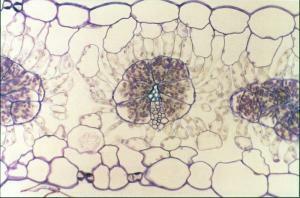 Cross section of rachilla of fertile floret of fall Panicum grass. 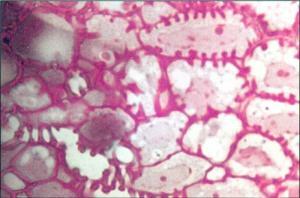 Some vascular parenchyma cells are specialized as transfer cells and exhibit conspicuous wall ingrowths. 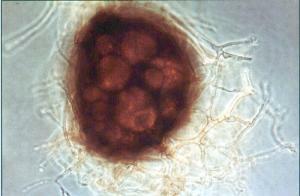 Left panel: a germinated Chara oospore (zygote) with a rhizoid and protonemal cell. 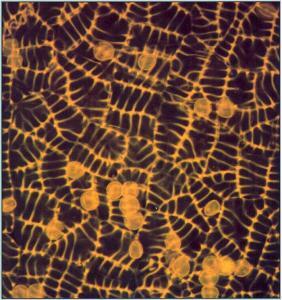 Right panel: Chara rhizoids that were generated from thallus cuttings. In both panels, the rhizoids are oriented relative to the gravity vector which is toward the bottom of the figures. Autofluorescent cell walls of the connective bases of three anthers of a thistle, Cirsium horridulum. 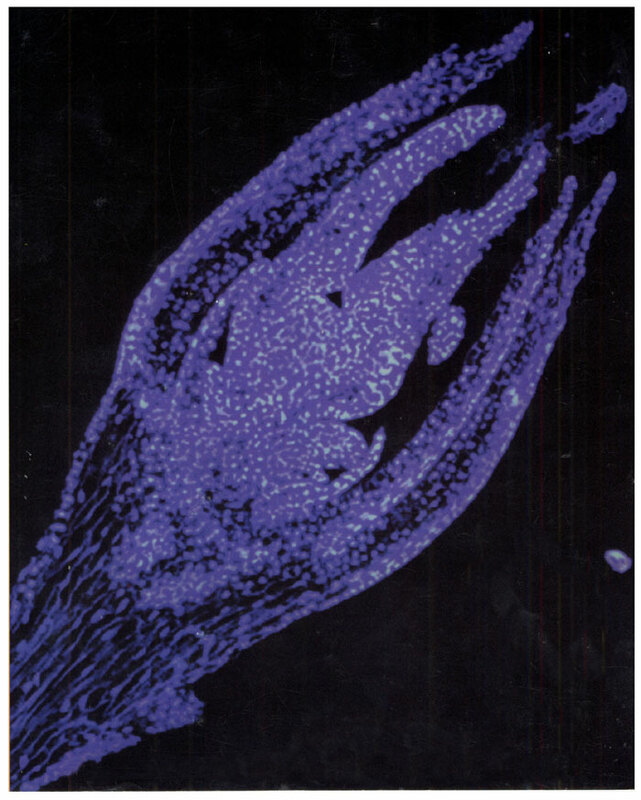 The stamen filaments extending down from each connective base are not visible because they lack the autofluorescent component in their cell walls. 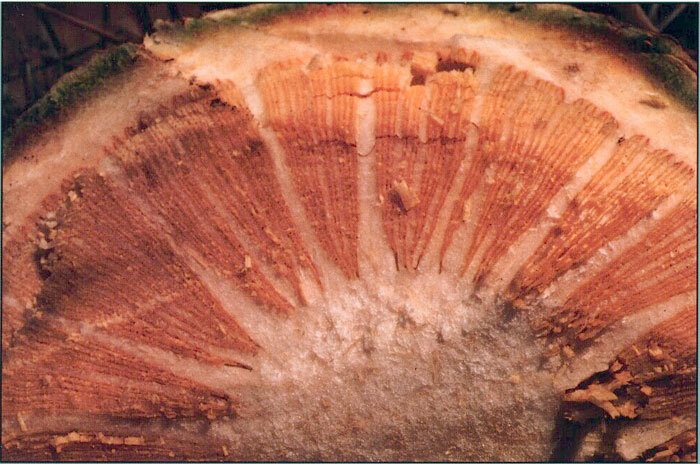 Transverse view of trunk interior of Browningia candelaris, illustrating adaptations wood rays and a broad pith with an extensive system of collateral vascular bundles. 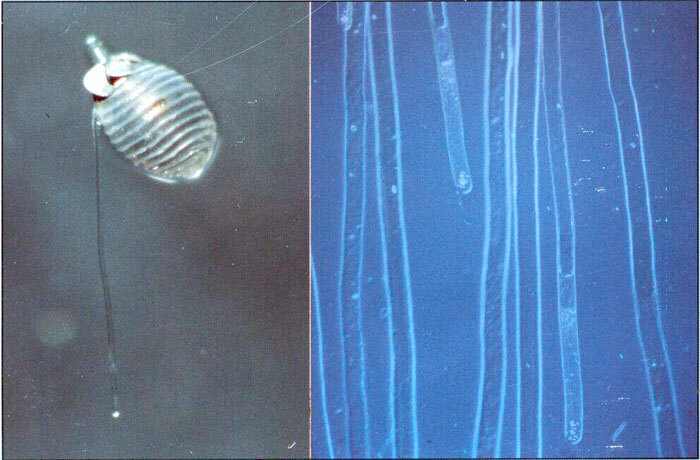 The coleorhiza epidermis has root hairlike extensions that elongate (upper right) during radicle emergence (lower left) of perennial ryegrass, Lolium perenne. Artifically colored scanning electron micrograph. 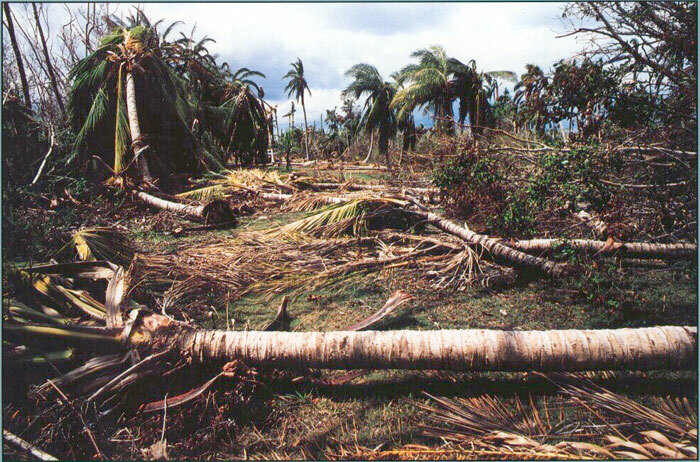 Hurricane Andrew (24 August 1992) blew down many large and rare palm trees at Fairchild Tropical Garden, Miami, Florida. 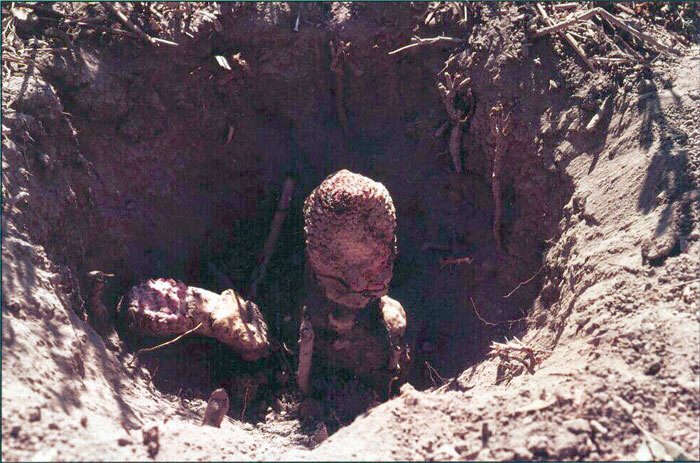 This disaster offered a unique opportunity to collect and study the apical buds of these massive monocotyledons as wells as the root and branch wood of a wide range of tropical dicotyledons. Section of chimeral apex of a Balanophora tuber. 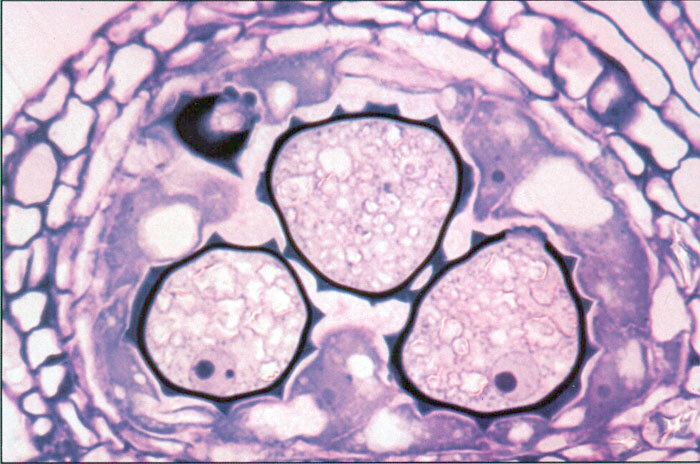 The composite bundle shown is an integrated mixture of host and parasite cells, which acts as the host/parasite interface. Parasite meristematic cells are large (large nuclei are yellow or blue, with small dots). Small cells with light blue nuclei are host meristematic cells (center of micrograph). Pseudocolorized image. Cross section of a mature leaf of the C4 species Atriplex rosea showing the striking structural differentiation of bundle sheath and mesophyll tissue. 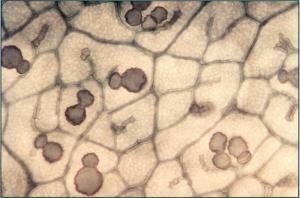 During leaf development, a bundle sheath-specific enzyme, RuBPCase, is expressed, coincident with vein delimitation. Later, a mesophyll-specific enzyme, PEPCase, accumulates, after formative divisions have ceased. 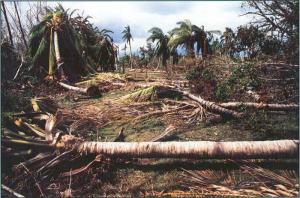 Enlarged area of cleared of palo verde (Cercidium floridum). 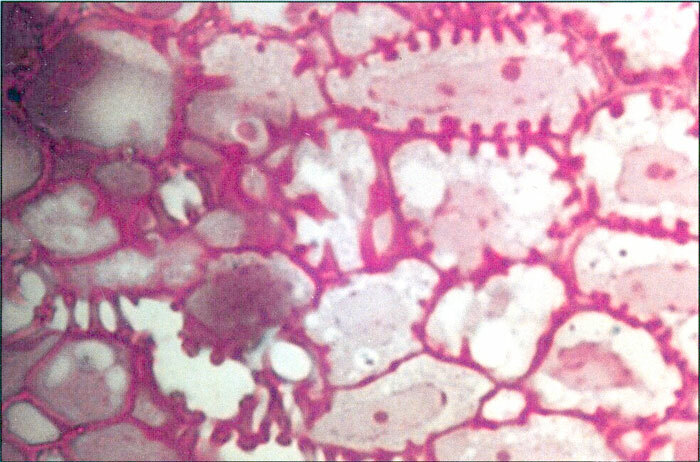 Empty cells (veinlet idioblasts), each interconnected by a perforation platelike gap, are unique to Cercidium, occurring mostly in pairs or clusters abutting terminal veins. Silver-plated models of Sphagnum branches were employed in studies of boundary layer properties. 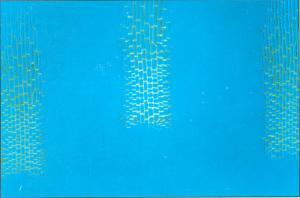 The model based on morphology of S. trinitense (left; an aquatic species) generated thinner boundary layers than the S. recurvum model (right; a nonaquatic species) when evaluated in an electrochemical fluid tunnel. Models are 10 times life size with the branch axes 10 cm long. 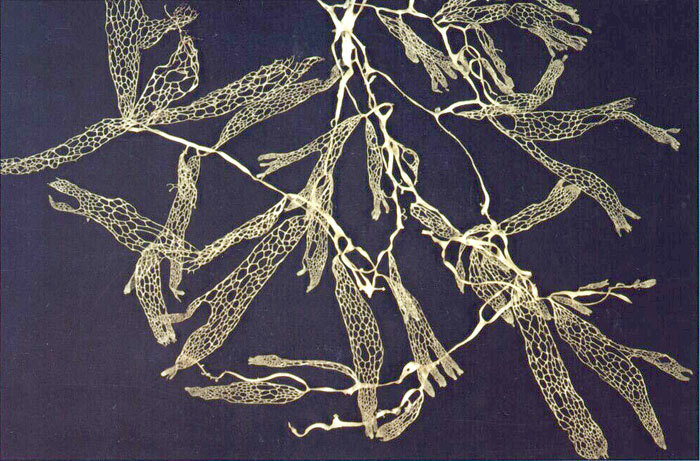 Thallus of the lace lichen, Ramalina menziesii, composed of net-like units, which develop by diffuse expansion of perforated tissue. Whole mount of fragment of sporangial epidermis from a Sphagnum girgensohnii capsule subjected to high temperature acid hydrolysis. 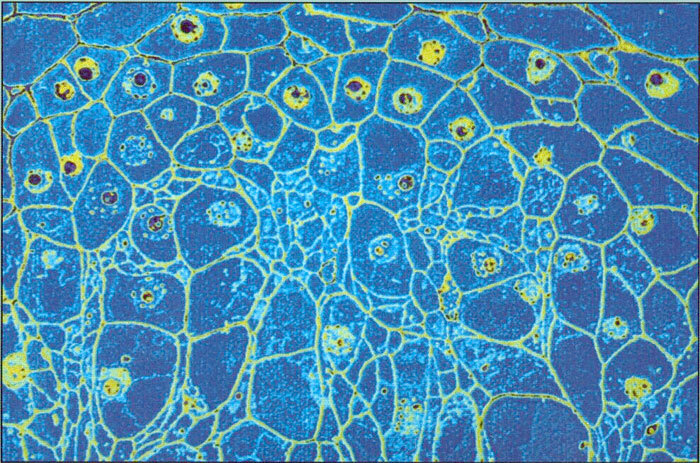 All cell walls have survived due to presence of resistant, autofluorescentwall compounds.Cell sizes,shapes, and patterns closely resemble those of Ordovician and later microfossils classified as "dispersed cuticles." This suggests that the mose ancient microfossils consisting of cellular sheets may represent some of the earliest known remains of plant sporophytic tissues. 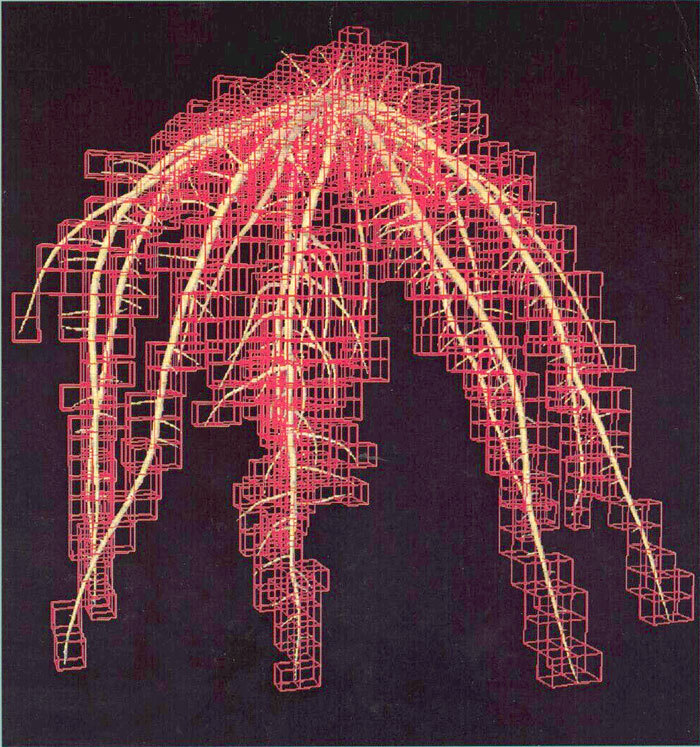 The growth of a bean (Phaseolus vulgaris L.) root system for 10 d, as simulated by SimRoot, a dynamic simulation model of botanical root systems based on empirical growth parameters. 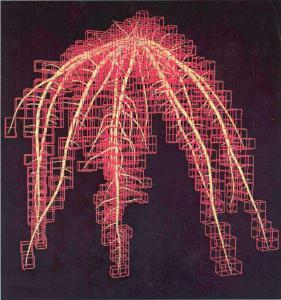 The three-dimensional fractal dimension of the root system was estimated by superimposing three-dimensional grids of varying size on the simulated root system in order to estimate the number of boxes in the three dimensional grid that was intercepted by the simulated root system. Alpha carbon backbone of the large subunit of ribulose-1,5-bisphosphate carboxylase/oxygenase, color coded to show residues conserved throughout the 300 million years of evolution of the seed plants. 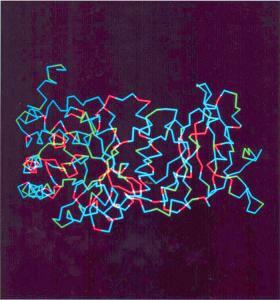 Absolutely conserved residues in red, residues with one substitution in green, and variable sites in blue. 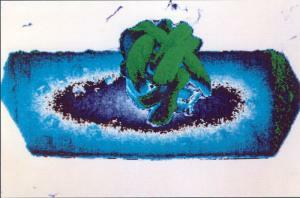 Longitudinal section of a pistillate floret of Heteropogon contortus, stained with DAPI. Nuclei are brightly stained in both gynoecium and anthers, even though the anthers have largely ceased growth. American lotus flower (Nelumbo lutea: Nelumbonaceae) on the second day of anthesis, showing a central, gynoecial receptacle and several whorls of dehiscent stamens. Historically, Nelumbo has been considered to be closely related to Nymphaeales (water lilies); however, new systematic work has allied the genus with lower eudicots. Scanning electron micrograph of an early floral developmental stage of the outcrossing subspecies of Clarkia xantania (Onagraceae). 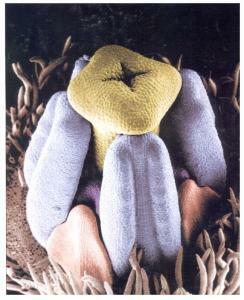 Sepals, which are covered by trichomes, have been partially removed and floral organs have been falsely colored: style and stigma, yellow; large anthers, blue; small anthers, purple; petals, red. 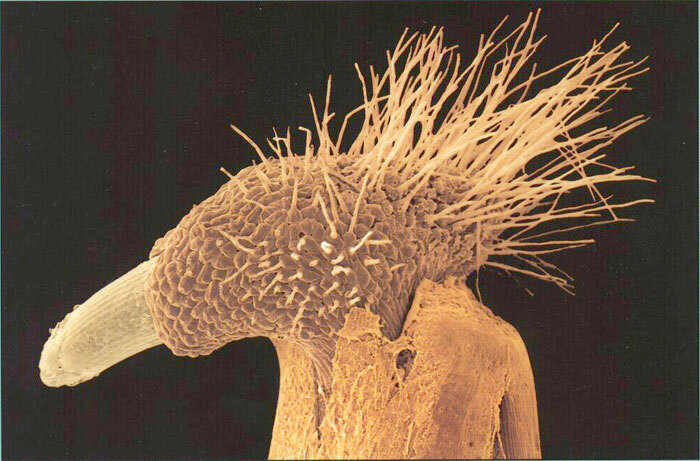 Scanning electron micrograph of dichotomously branched, subterranean gametophyte of Psilotum nudum grown in axenic culture. 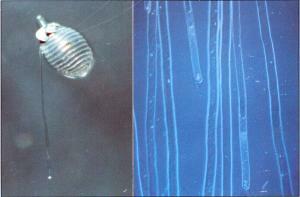 Antheridia are falsely colored blue, archegonia are salmon colored, and hairs and rhizoids are brown. 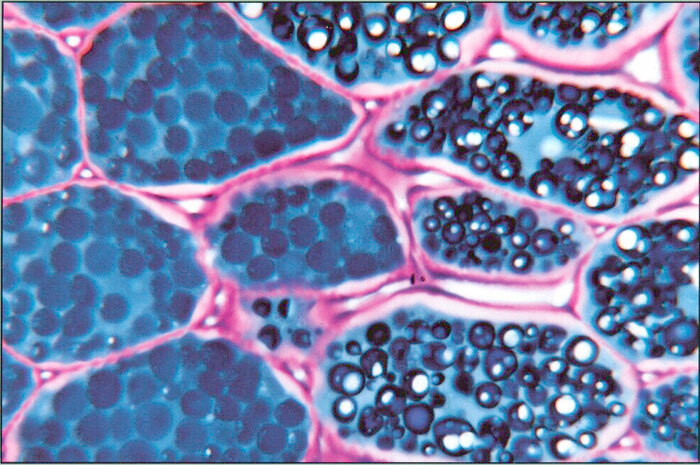 Cross section through the dehisced anther of Xylopia collina of the pawpaw family (Annonaceae). 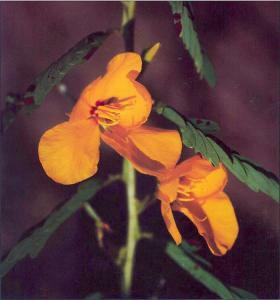 Species of the genus Xylopia, as well as other members of this family, produce large pollen that is shed in units of four or sometimes even 32 grains (some tetrads visible in illustration). 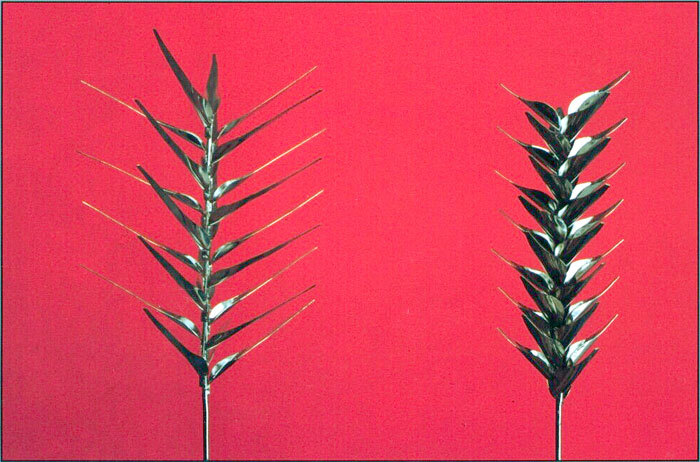 Associated with these compound pollen units in most genera are layers of sterile tissue, called septa, that separate the grains into chambers within each anther. Tsou and Johnson investigated the variation and development of the septa of Annonaceae, and found that despite variability in appearance, the septal tissues of all species were formed by the same developmental pathway. They propose that these tissues may have evolved in Annonaceae in response to a requirement for extra nutrients and support tissues for large pollen units. Tetraplasandra gymnocarpa (Hillebr.) 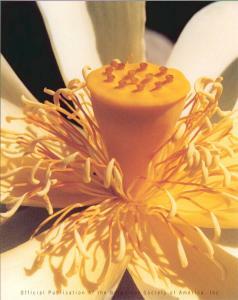 Sherff is the only species in the Araliaceae with a fully superior ovary. This endangered species is endemic to the windswept, summit cliffs of the Koolau Mountain Range of Oahu, Hawaiian Islands. 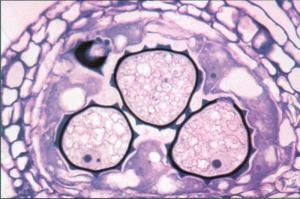 The superior ovary in T. gymnocarpa developed from an inferior ovary ground plan. It is hypothesized that this evolutionary shift could be due to a shift in pollinator strategy that allowed a relaxation of the selective pressures favoring an inferior ovary.